Chen Guangxin, who has witnessed the decades-long development of modern horse racing in China, picked up his hopes for this burgeoning industry after China's State Council recently announced that it would encourage horse racing along with water sports in Hainan to further open up the economy of the southernmost island province. "We already see the light," Chen gleefully told Southern Weekly. As a council member of the China Horse Industry Association, the man experienced the golden era of the 1990s and its subsequent retreat in Guangzhou, South China's Guangdong Province, in 1999. Since then, he has been pessimistic about the industry. Seeing a new opportunity, Chen is taking the lead in joining an industry that is once again regarded as promising following the government's announcement in April. His company has signed an agreement with animal husbandry firm Luoniushan Co., Ltd in exploring a horse culture-themed industrial park in Haikou, Hainan's capital. Chen is just one of many who are sniffing out new business opportunities, including the lottery, related to the island's future horse racing industry. But against this excitement is governmental ambiguity. While investments are storming into the island, Hainan regulators recently banned horse-related companies from registering. Insiders analyzed that too much investment at the same time might bring bubbles to the industry; thus, the Hainan government is cautious about horse racing and trying to cool the sweltering market. Bewildered investors question where the policy will land them, but remain hopeful for a possible opening-up for horse racing on the island or even the whole country. Chen witnessed the twisty development of horse racing in China after he was transferred from governmental organs to the horse racing sector in Guangdong in 1992. Having gone through a period of governmental ambiguity, Chen was very sensitive to the government's announcement in April and felt a new era was coming for horse racing. Chen told Southern Weekly that it only took half a month for his company to reach an agreement with Luoniushan to build a sports park. The company in charge of this project is a subsidiary company of Luoniushan, which started the horse racing project earlier than the release of the State Council's announcement. According to Chen, it is not that the company received the news beforehand, but rather that the persistence on reform and opening up of the 19th National Congress of the Communist Party of China, in addition to the Boao Forum for Asia (BFA), compelled them to believe there would be a breakthrough in the policy. Luoniushan ran the fastest in this round. 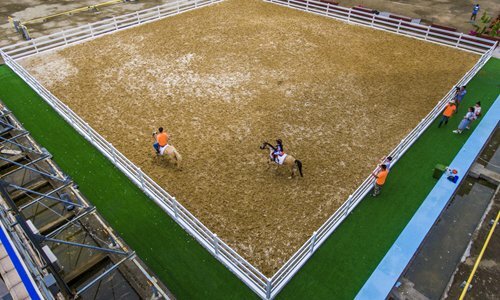 Now it has finished its sites selection for horse racing: one is located in the Luoniushan farm in the suburb of Haikou, the other downtown, both of which are expected to be finished by 2020. Several other horse racing companies have also entered the market this past month. Local real-estate, energy and sports companies are also joining industries related to horse racing sports or horse racing culture. Businesses beyond Hainan are likewise looking for new investment opportunities. Chen told Southern Weekly that many investors, including listed companies from Hong Kong and big tourism groups in Northeast China, are all waiting for the start gun. 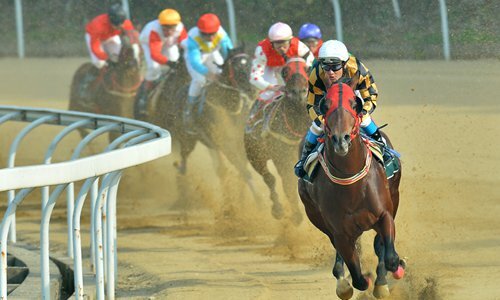 There are 47 companies related to horse racing industry in Hainan, as Tianjin-based Innovative Finance Observation reported. But it seems that history might be repeating itself. According to Innovative Finance Observation's report, Liu Shusheng, manager of a house-purchasing platform for Hainan, submitted his application for "Hainan Horse Racing Network Corporation" for the second time on May 24. He plans to build an information and service platform for horse racing in Hainan, together with Hainan Enterprise Federation, to provide webcasting, betting and other horse racing-relevant businesses. However, no matter what homophonic words he used repeatedly to replace "horse racing" in order to apply, the local industry and commerce department continued to reject his application. The reasons the department gave included "Any words of horse racing or its homophonic words cannot be used as a name of a corporation" and "horse racing, finance and digital currency integration related industries are not currently being approved." In fact, Liu knows that all applications, which include words for "horse racing," "racecourse" and "jockey club," were halted by the Industrial and Commercial Administration Bureau of Hainan Province in early May. Before the ban was issued in May, a few pioneers succeeded in registration, including Changqing Equestrian Club (Hainan sector) and Guosheng Baiying Horse Racing Club (Hainan) Corporation. Among the companies that had the guts to be the first movers, Luoniushan was the leader. After the government announced it would build Haikou into "an international horse racing entertainment and culture town," share prices of Luoniushan rose 60 percent within 20 days. But the animal husbandry company now faces a problem. Sources told news portal thepaper.cn that Luoniushan's project only received a record filing certificate, which is different from gaining the approval of local development and reform commission. Further urban and rural planning and environmental assessments need to be done. Developing horse racing is a dream that Hainan has yearned for the past 30 years. 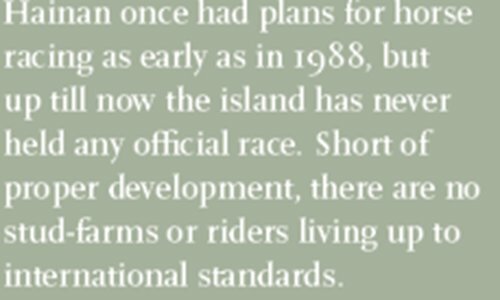 As reported, Hainan once had plans for horse racing as early as in 1988, but up till now the island has never held any official race. Short of proper development, there are no stud-farms or riders living up to international standards. Liu Shusheng used to work in a horse racing company and was engaged in Hainan's plan for horse racing in 1992. Liu told Innovative Finance Observation that at that time, as the Hainan government regulated, the horse racing project was big enough to cover 2,000 mu (1.3 million square meters), and would host 50,000 spectators. The total investment, as planned, reached 500 million yuan ($78 million). But Hainan's horse racing project failed to start in 1993 after government officials showed disapproval when inspecting Hainan. The project came to a halt due to policy restrictions and a lack of capital. Meanwhile, another horse racing company in Guangdong, built in 1992, persisted under pressure and took the industry lead until 1999. But Hainan never gave up on the sport, hoping to make horse racing a highlight of the island's tourism. Local enterprises and associations suggested associating the sport with the lottery, and National People's Congress deputies put forward suggestions related to horse racing in the country's annual two sessions back in 2004 and 2007. What attracts capital is not the horse racing sport itself, but horse racing plus betting. There is no question that the lottery is an important part of the horse racing industry. Although the call to open up a horse racing lottery can be traced back to 1982, when Guangzhou, Beijing and Wuhan all tried to start the industry, it was banned because the industry is directly connected to gambling. If looking from the perspective of the industry chain, horse racing covers the industries of animal husbandry, services and lottery. 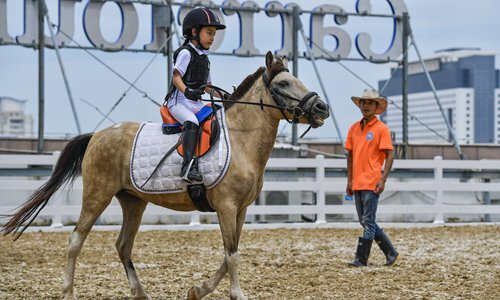 Upstream enterprises focus on horses, which included auction business, horse breeding, horse training, competing and so on; downstream enterprises target horse racing and competitions, which involve competition operations, media broadcasting, theme tourism and lottery. At present, major racecourses in the Chinese mainland are located in Hubei, Shanxi and Yunnan provinces. Their profits mostly come from horse trading, horse training and sponsored competitions, however, it is hard to make a profit because the maintenance costs are very high. "I have to use the money I earn from other businesses to subsidize the Orient Lucky City Racecourse," Hu Yue, who is in charge of the racecourse in Wuhan, Hubei Province, told media. If the horse racing industry wants to be promoted, the only "locomotive" is the lottery, Hu added. Through running a lottery and raising funds, the breeding selection can be improved in order to promote both upstream and downstream enterprises. According to the latest policy, a quiz-type sports lottery and a major international events lottery will be an important part in Hainan's development plans. Although everything is uncertain, opening up the horse racing lottery is highly anticipated. This is supported by deputy professor Du Na from College of Geography and Environmental Science of Hainan Normal University, who told Innovative Finance Observation that "China has both the hardware and software environment to develop the horse racing lottery." Du added that the country has the institutional framework of running a quiz-type sports lottery, as a horse racing lottery is the same lottery type as soccer and basketball. But running the industry well is not an easy job. The success of the Hong Kong Jockey Club has many prerequisites: it adopted the horse racing culture from Britain, its board of directors are all important figures in local society, and Hong Kong has accumulated a large number of punters, which require time and professional work. Chen agrees that building a racecourse requires a great deal of preparation, such as establishing rules for Chinese horse racing, designing the lottery and relevant personnel issues.